Last May my wife and I went and saw the new JJ Abram's Star Trek movie. I realize I'm probably in the minority here, but as fan of the original series, I was generally disappointed with the film. Can a movie have too many special effects? Too many explosions? Fight scenes that are so unrealistic that they border on the absurd? Can a movie have so much "action" that it actually detracts from the story? Wow, Lenord Nemoy is really getting old. And where was Bill Shatner? They couldn't find a cameo for him? 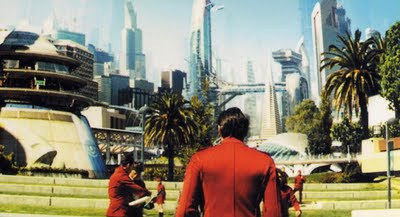 Of course, the movie had some enjoyable scenes, including the ones featuring the "Star Fleet Academy" in a futuristic San Francisco. I thought to myself, "Star Fleet Academy really looks like the library at Cal State Northridge." A few more minutes into the film, I realized it was the library at Cal State Northridge. Living in Los Angeles, it's fun seeing how familiar (and not so familar) places are changed to fit in a film - especially if it's set in the past or the future. This past week I was meeting with some professors over at Cal State Northridge and took some pictures to see if I could match the photo from the film. Pretty amazing what some special effects can produce. I found this photo from http://www.movieweb.com/. Someone from CSUN took a few photos through an office window during the filming on campus in March of 2008. You can clearly see the "blue screen" which allowed the special effects crew to matte a 23rd Century San Francisco. Here's another shot from the film that really took advantage of blue screen and mattes. The only part that's Cal State Northridge is the grass, the steps, and the palm trees. Maybe that's how CSUN will look in the year 2309. But this being Los Angeles, I imagine there will be some zoning issues with the homeowners associations around campus. 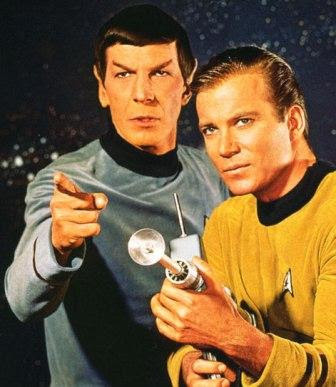 So, what's the appeal of Star Trek? Perhaps that deep down most of us are hoping for a better future for our great-great grandkids and for planet earth - even if it's 300+ years in the future. Of course, some of the "futuristic" technology in the films already exists. And while other things like "transporter beams" may never happen, they look very cool on film. Over the years, Star Trek (the shows and the movies) have surfaced some great questions: What is humanity's purpose in the universe? What does it mean to be human? Are there moral absolutes? Is there life beyond planet earth? Is there an afterlife? Who - or what - is God? While I don't necessarily agree with all the answers the show proposes, they're still great questions. Wasn't it Socrates who said "the unexamined life is not worth living?" Here's to finding the answers to those great questions. I saw the movie, too, and recognized the CSUN library. Mildly entertaining, I guess I'm not too impressed with the JJ Abrams version (sorry all you Trekies out there).